Here at our salon, we share your passion for beauty and health. That is why we will accept nothing but the finest in nail care, service standards, and quality products. We strive to maintain a relaxed and professional atmosphere for our clients. our staff is dedicated to helping you make the choice of inner and other wellness and beauty as a lifestyle. Every aspect of our salon is devoted to the pursuit of excellence, and from this comes a genuine feeling of integrity and pride in our products, our services and ourselves. 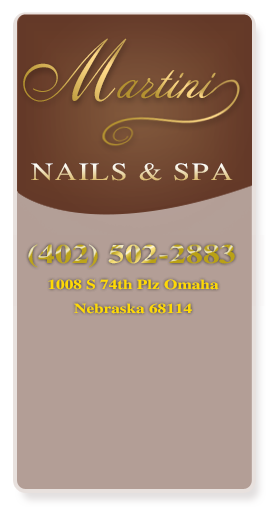 All nail services are provided at Martini Nails & Spa such as Manicure & Pedicure to many additional services like Waxing… All is served by professional technicians with qualified products. Customers will get chance to enjoy the best moments at airy and clean place. You can escape from all the stresses after a long day working during your hands become softer and your feet will be pampered. Get the chance to rejuvenate your beauty at our salon. Copyright © 2015 Martini Nails & Spa. All Rights Reserved.